Crowned Roman Gladius, Tempered What's this? Few civilizations were as good at stabbing people as the Romans. I mean, Romans stabbed EVERYBODY. Legionnaires stabbed with pilums (spears) and swords. Gladiators stabbed with swords, spears and tridents. Heck even politicians got involved; practically the entire senate stabbed Julius Caesar. It's no wonder that a civilization so in love with stabbing one another came up with one of the most perfect thrusting swords in history. The gladius, with its horrific 'V' shaped tip and thick, straight blade, was perfect for the fighting style of roman Legionnaires. It was short enough for close formation work, but lethal enough to make large gouges in the vital organs and faces of those stupid enough to close with them. 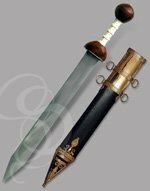 This gladius is a gorgeous version of the sword that conquered 75 percent of the known world. It's a replica of a standard "Pompeii" style gladius, with a few important modifications. The greatest modification is the "Crowned" pommel; a mushroom style pommel that gives your hand acres of space to play with and ensures a happy, comfortable hold. 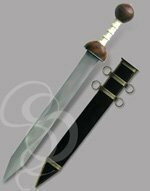 A black leather wrap around the thick wooden grip seals the deal, making it one of the most comfortable gladius models that we sell. The wooden gaurd is polished to a high shine, as is the pommel, which features two decorative carved lines that run the entire cirumference. A historically accurate brass shock plate hugs the bottom of the gaurd, and the entire hilt assortment is locked tightly in place by a sunken cloak bolt. 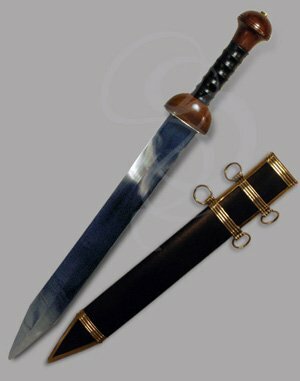 The tough high carbon steel blade is 20 inches long and two inches wide (historically accurate dimensions for a gladius) and features the aforementioned "V" tip. The Gladius Legionnaire comes with a custom-made wooden sheath that is wrapped in black leather. We currently have limited quantities of this gladius, so grab your now before the first wave is gone. I bought an engraved Gladius Legionnaire as a gift to my wife, to symbolize her warrior status according to Ephesians 6:17. She was moved to tears, and keeps it on the coffee table as a reminder. We are very satisfied with the quality of the sword and the engraving. Thanks! Why not a 5? The Chappe (rain guard) appears to be missing; it appears in the photo "sba-legionnaire3_s" but it is not on the sword that we received. We had to add a spot of glue on the sheath, and one tab of the leather on the inside of the sheath locket.